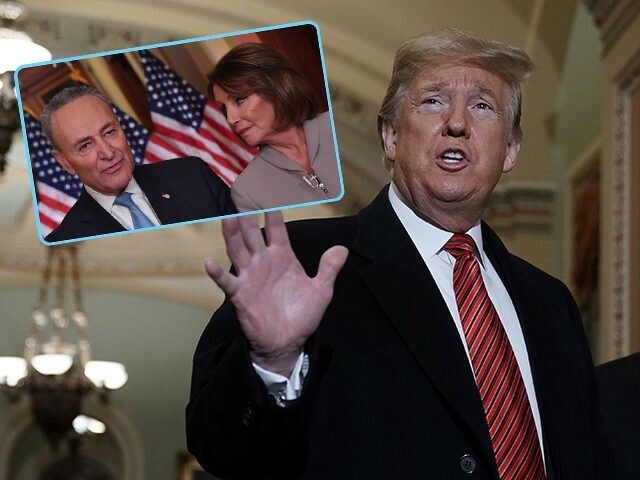 President Donald Trump walked out of a White House meeting with Senate Minority Leader Chuck Schumer and House Speaker Nancy Pelosi after they made it clear they were not willing to negotiate with Republicans to reopen the government and fund construction of a border wall. “Just left a meeting with Chuck and Nancy, a total waste of time,” Trump wrote on Twitter. Trump asked Nancy Pelosi if she would bring up a vote for border security within 30 days if he signed a bill to reopen the government. Vice President Mike Pence noted that Democrats remained unwilling to negotiate a deal with the president and confirmed Trump’s account of the meeting. “When she said no, the president said, ‘goodbye,’” Pence recalled. Reporters confirmed after the meeting that Trump literally said, “Bye, Bye,” before walking out of the room. Pence urged Americans to call their representatives to get them back to the table. “The door here at the White House is wide open,” he said. Congressional Republicans confirmed the account after the meeting, noting that Schumer and Pelosi refused to commit to any funding for a wall within 30 days, even if the government was reopened. House Minority Leader Kevin McCarthy said that the president was in a good mood and wanted to make a deal with Democrats. “He even brought a little candy for everybody,” he said. But McCarthy said Pelosi refused to acknowledge the border crisis and that Schumer raised his voice while addressing the president. “Their behavior is embarrassing to me,” McCarthy said, accusing them of lying about the nature of the meeting. He added that the media should bring their cameras into the next meetings so that everyone could see for themselves the nature of the conversations. Pelosi and Schumer also spoke to reporters after the meeting. “It’s cold out here and the temperature wasn’t much warmer in the Situation Room,” Pelosi said with a shiver, speaking to reporters outside the White House. Schumer said that the president slammed the table in anger, a claim that Republicans disputed.